This was the second time we stayed at the Queen Street location. It is close to St Paul's and several underground stations. Also several restaurants close by and a place for a quick pizza on the corner. Short distance to many theaters for musicals. Close to bridges to walk to the south bank for the attractions. The furniture is nice, kitchen is really nice with everything needed for a stay. Stores close by to purchase food. We ate many meals in the apartment. Staff was always friendly and accommodating. When we return to London will always check to see if something is available. The location was so close to the tube and St. Pauls, and that was important to me on this trip. It was also easy to catch buses & walk to other places like the Thames and Fleet St. The elevator was a nice size, and the room was roomy & quiet. I wish I could have stayed longer. The location is very great！Two underground stations-the Cannon Street and the Mansion House-are nearby. The Thames River scenic spots and St. Paul's Cathedral are accessible on foot. The area is very good and central, close to a metro station. Effectively a good size studio apartment right in the heart of the business centre of the City - with coffee shops, bars and restaurants within a few minutes walk. Superb value. Very clean and spacious. Perfect stay, will definitely be booking again. I've stayed here four times now and it has always been great. 24/7 reception is helpful, and although near the busy pubs the noise is blocked well by the windows. Great place for setting up base in the city, with friends or for business. Lock in a great price for Marlin Apartments Queen Street – rated 8.3 by recent guests! Marlin Apartments Queen Street This rating is a reflection of how the property compares to the industry standard when it comes to price, facilities and services available. It's based on a self-evaluation by the property. Use this rating to help choose your stay! One of our top picks in London.With stylish decor and free Wi-Fi, Marlin Queen Street offer 4-star accommodations in central London. The apartments are 1,650 feet from St Paul’s Cathedral, and just 10 minutes’ walk from South Bank. The luxury apartments feature open-plan living areas with bare wooden floors and modern furniture. Each apartment has a TV/DVD player, seating area and work desk. Guests can also benefit from a weekly maid service, bedlinen change, and a 24-hour emergency contact. The fitted kitchens at Marlin Queen Street feature a microwave and refrigerator, and laundry facilities are provided. The apartments also have modern bathrooms with luxury toiletries. 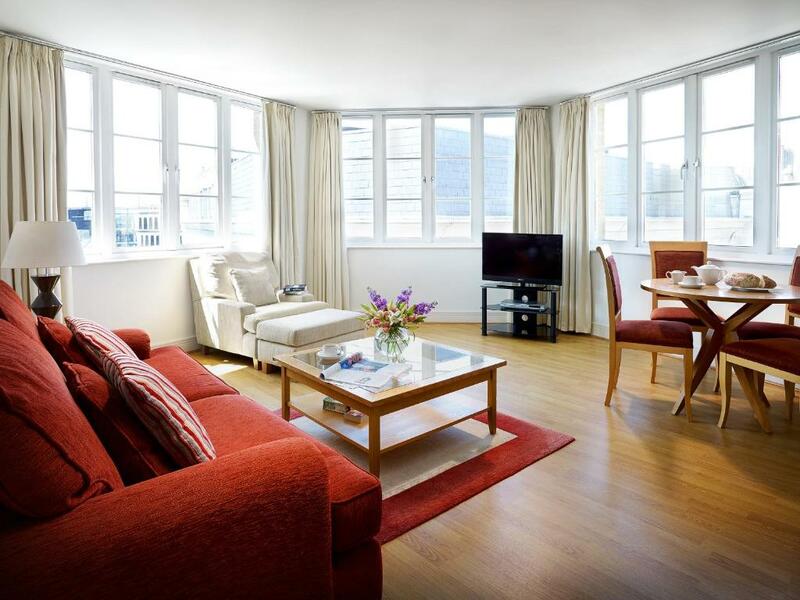 The apartments are located in the heart of The City, just a 2-minute walk from Mansion House Underground Station. The Strand and Covent Garden are a 20-minute walk away. 뀐 Located in the real heart of London, this property has an excellent location score of 8.8! When would you like to stay at Marlin Apartments Queen Street? This apartment has a sofa and a TV with a DVD player in the lounge area. The full kitchen includes a dishwasher, oven and a dining area. Marlin Apartments Queen Street was Marlin's first serviced apartment property and has original building features including wide sash windows which let in an abundance of light. With the tube just a moment's walk away you can travel around the city in no time. The City of London is a busy district of London full of things to do, from attractions including Tate Modern, Southbank Centre, St Paul's Cathedral and One New Change shopping centre, to quality restaurants such as SushiSamba, Jamie Oliver's Barbecoa and Gordon Ramsay. Area Info – This neighborhood is a great choice for travelers interested in history, city trips and city walks – Check location Great location - show map Guests loved walking around the neighborhood! House Rules Marlin Apartments Queen Street takes special requests – add in the next step! A GBP200 damage deposit is required on arrival (around USD259.11). This deposit will be fully refunded 7 days after check-out, as long as there isn't any damage to the property. All older children or adults are charged GBP 54 per person per night for extra beds. Marlin Apartments Queen Street accepts these cards and reserves the right to temporarily hold an amount prior to arrival. Please note the apartments reserves the right to pre-authorize credit cards on arrival at least GBP 200 during weekdays, and GBP 500 at the weekend. The property can only accept chip-and-PIN cards for pre-authorization. Marlin Apartments will ask you to provide photographic ID (passport/driving license) and the card used to make the booking upon check-in. If you are not able to provide this, you may be re-charged on a card you do have present upon check-in, and the original payment will be refunded. A sofa bed can be provided for an additional guest (see Hotel Policies for further information). Twin beds can also be requested. Please use the Special Requests Box when booking to note any requests, which will be subject to availability. Should the maximum number of people per apartment be exceeded without authorization, guests will be charged. Please be aware that Marlin operates a strict no-party, no gathering policy. Failure to check-in by 09:00 on the day after your booked arrival date, without prior notification that you intend to arrive at a later date, may result in your reservation being canceled. Please note that images are for illustrative purposes; the actual apartment may differ. A damage deposit of GBP 200 is required on arrival. That's about 259.11USD. This will be collected by credit card. You should be reimbursed within 7 days of check-out. Your deposit will be refunded in full by credit card, subject to an inspection of the property. This year there is road work close by that was noisy at times. Furniture a little low for tall people, but just a minor problem. One fan in the apartment that needed to be moved from room to room when warm. Just minor inconveniences. Warning to thinking about booking this accommodation they tempted to give you a reasonable price, but actually, they took from me 200 Pounds deposit and delayed in retrieving without reasons, They told me to call bank, and my bank told me to need payment release from this apartment they should send the invoice to us ,So until today more than 25 days and still haven’t recovered the money, it is a horrible place really thieves in a professional way. Please Don't stay in this place under any reasons. Forgot that there’s a tube line right underneath so I felt as if the train was right under the bed. Suffered from inner city noise and bedroom window, despite double glazing, didn’t seem to reduce it much. Some rumbling from the underground trains running beneath the apartment but if you’re tired and in a comfortable bed it isn’t a major issue. Frankly if you choose accommodation in the centre of a vibrant city it’s not unreasonable to expect such things. It wouldn’t stop me staying there again. Location perfect for our dinner at Mansion House. Far more spacious than I had expected. Good reception. Comfortable bed and large lounge with Sony TV and Sky provided. Good WiFi. Good kitchen with tea, coffee and milk provided. Spacious bathroom with excellent shower. All in all a fabulous ‘find’ right in the heart of the City of London. I had friends flying in who arrived before me and they had my driving license as ID. I think if that happens they should be let into the apartment. Even with the windows closed it was very noisy outside (maybe the fact it was a busy Thursday night in central London but double glazing wouldn't have gone amiss) and as it was a very hot apartment I would have appreciated being able to open the windows to cool it down. Perfect location, only a couple of minutes walk from the closest tube station. Very spacious apartment with all necessary ameneties. The water / milk / tea and coffee were a nice touch. The size of the apartment and the way it was equipped, the bed was very comfortable. The location was good and near to transport.